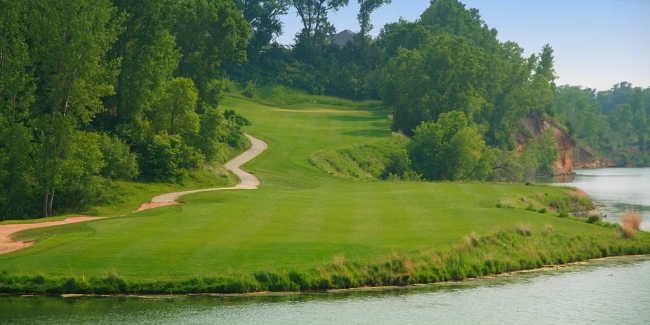 Located between Mahoney State Park and Ashland NE, Iron Horse Golf Club is just minutes from Omaha and Lincoln. The Gene Bates designed course is built around an old rock quarry and features steep elevation changes and incredible views. In 2002, Golf Digest recognized Iron Horse as one of the "Best New Affordable Public Courses in America". The course weaves through cottonwood and burr oak forests, native prairie grasses and along a quarry lake. Perched above Lake Iron horse, the par 4 ninth, drops several stories to the quarry floor. The elevated tee box provides panoramic views of the quarry lake and the stately club house. Co-owner Tim Young echoed, "It is my favorite hole because of the view and the steep elevation drop." Mark Boyer, co-owner, teased, "It is also the closest hole to the club house, if you run out of beer." A stiff drink might be needed for the upcoming hole. The 575 yard par 10th might be regarded as one of the toughest par 5's in the state. From the tee, wetlands protect the left side of the narrow fairway and a 40 acre lake guards the entire right side. The second shot might be more intense than the drive. The fairway narrows to six yards wide as it climbs the quarry bluffs. Target golf is needed to layup on the uphill sloping, second tier fairway. Bottom line, the hole is an exhilarating test of golf. For the record, I lost 2 balls, all off the tee. In the late 1800's US Army Captain Beetison built his homestead on the property. The house doubled as a lookout tower providing security for strategic parts of the Oxbow supply trail with visibility to the state capitol building. Built in 1868, the structure is one of the oldest in Nebraska.